Stay warm and look wonderful with these free knitting patterns! Beginner knitting patterns may seem hard to find or impossible to complete, but we're here to prove you wrong. There are so many free knit scarf patterns, easy projects and other ideas to keep your needles happy all year long. Whether you want to learn how to knit a chunky scarf or just want a few knitted scarf patterns to add to your winter wardrobe, this is the perfect collection for you. Download 12 Knitted Scarf Patterns: Fabulous Free Knitting Patterns for Beginners and discover tons of great ideas. Once you learn how to knit a scarf for beginners, you'll want to make a variety of other knit items. Remember, these projects also make great gifts, so be sure to save this collection of free knitting patterns for beginners. Get crafting and creating with these projects to inspire you and your family and friends. Feel free to share this eBook, and be sure to sign up for our free eNewsletter to get handmade inspiration right in your inbox. Coconut Milk Scarf (pg. 5) - Savor the beautiful design and calming colors of the Coconut Milk Scarf. If you're looking for a versatile knit scarf pattern for women of any age, this is the perfect project. Grab your needles and work up this quick and easy knit scarf pattern. You can throw this scarf around your neck when it's cool and know you're going to be warm, toasty and trendy. Dragon Stitch Scarf (pg. 14) - Knitted scarf patterns with the word "dragon" in the title may seem scary for many reasons, but this project proves that to be untrue. The colorful look and soft feel with make this a real winter stunner. Scrunch it up or lay it flat on your shoulders - this is one of these scarf knitting patterns that looks good no matter what. Mountain Mist Scarf (pg. 19) - Take a trip to the mountains without ever leaving home. Find out how to knit a scarf for beginners and soon you'll be able to make projects just like this one. There's no need to worry about this project - the stitches and seweing techniques used to complete this scarf are actual super easy to follow on your own. Makin' Bacon Scarf (p. 22) - All the fun with none of the calories! If you like beginner knitting patterns, then you'll fall in love with this project. Best of all, you only need three balls of yarn, so there's no way you'll end up breaking the bank. Wear your love of bacon around your neck and show how much fun knitted scarf patterns can be. Two Tone Cowl (pg. 7) - This infinity scarf knitting pattern is so easy to complete - you won't believe it's meant for beginners! Use two skeins of yarn and before you know it, you'll have a fabulous scarf to wear around town. Knitted scarf patterns like this one are all the rage right now, so you'll look extra trendy to boot. Knit Scarflette (pg. 16) - A scarflette is a fun alternative to a standard knit scarf pattern. Make your needles happy and create your own version of this quick and easy project. Use leftover yarn to complete your scarflette - it's a great stashbuster project. Add a button to the bottom of your project to add some extra versatility. 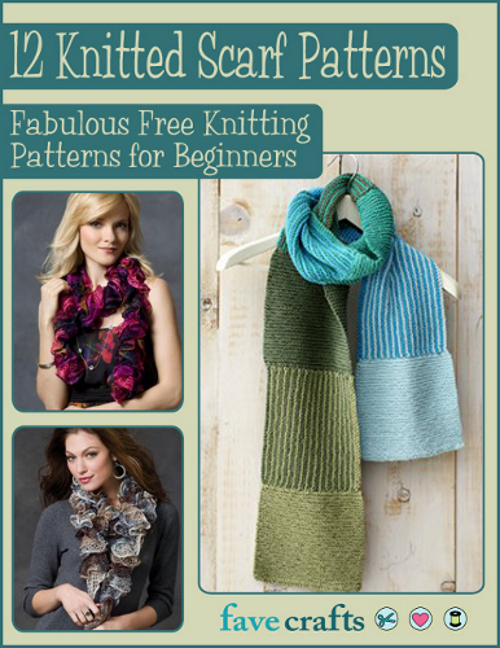 Filled with fabulous ideas for turning skeins of yarn into fabulous scarves, 12 Knitted Scarf Patterns: Fabulous Free Knitting Patterns for Beginners is a fabulous book for the adventurous crafter. Complete with helpful tutorials, hints and tips, you can learn how to add life to any outfit. These scarves make great gifts too, so be sure to save this free eBook and take it out during the holiday season. Hi there! You can find a pair of knit leg warmers here: https://www.favecrafts.com/Knit-Socks-and-Slippers/Fashion-Leg-Warmers Enjoy! It has been many years since I first learned to knit and I gradually turned to crochet, but recently I have been looking for scarf patterns to knit. I think these patterns would be the easiest to retrain myself on knitting. I am use to only using one hook so these will help get back into the groove so to speak.